15 Bighorners are large animals native to the West Coast. Their horns, meat, and hide are useful for many products. 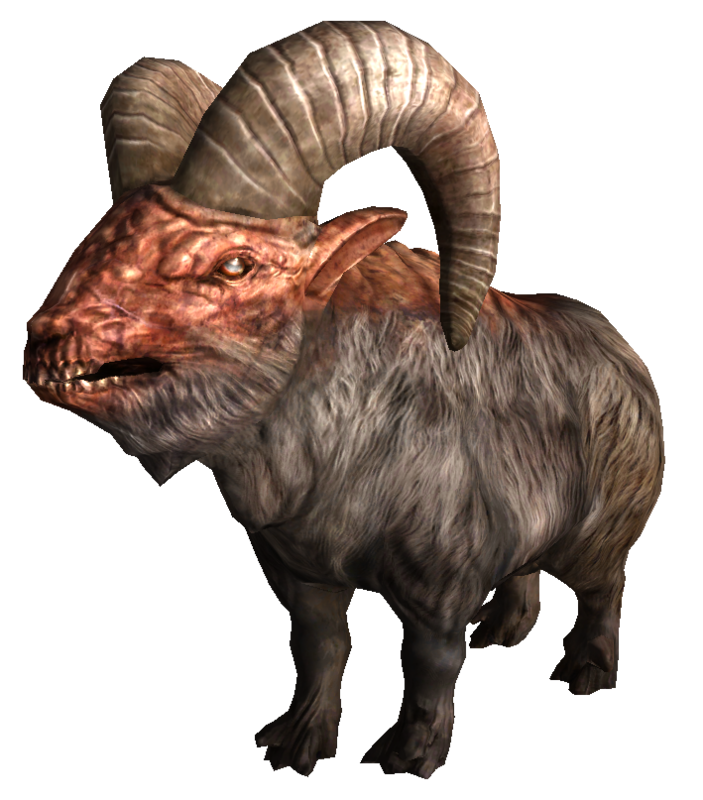 20 A bighorner is rarely hostile, though a herd may react aggressively if another creature comes too close. Attacking one bighorner in a herd invites the vengeance of the entire herd, even the calves. 25 A bighorner herd can often be found in close proximity to banana yucca plants, which they seem to enjoy. 20 Bighorners are descended from bighorn sheep ovis canadensis. Charge. If the bighorner calf moves at least 20 feet straight toward a target and then hits it with a ram attack on the same turn, the target takes an extra 3 (1d6) bludgeoning damage. If the target is a creature, it must succeed on a DC 12 Strength saving throw or be knocked prone. Sure-Footed. The bighorner calf has advantage on Strength and Dexterity saving throws made against effects that would knock it prone. Ram. Melee weapon attack: +4 to hit, reach 5 ft., one target. Hit: 5 (1d6 + 2) bludgeoning damage. Charge. If the young bighorner moves at least 20 feet straight toward a target and then hits it with a ram attack on the same turn, the target takes an extra 5 (2d4) bludgeoning damage. If the target is a creature, it must succeed on a DC 13 Strength saving throw or be knocked prone. Sure-Footed. The young bighorner has advantage on Strength and Dexterity saving throws made against effects that would knock it prone. Ram. Melee weapon attack: +5 to hit, reach 5 ft., one target. Hit: 8 (2d4 + 3) bludgeoning damage. Trample. Melee weapon attack: +5 to hit, reach 5 ft., one target. Hit: 8 (2d4 + 3) bludgeoning damage. Charge. If the bighorner moves at least 20 feet straight toward a target and then hits it with a ram attack on the same turn, the target takes an extra 7 (2d6) bludgeoning damage. If the target is a creature, it must succeed on a DC 14 Strength saving throw or be knocked prone. The bighorner may then make a trample attack against the target. Sure-Footed. The bighorner has advantage on Strength and Dexterity saving throws made against effects that would knock it prone. Ram. Melee weapon attack: +6 to hit, reach 5 ft., one target. Hit: 11 (2d6 + 4) bludgeoning damage. Trample. Melee weapon attack: +6 to hit, reach 5 ft., one target. Hit: 9 (2d4 + 4) bludgeoning damage. Charge. If the bighorner bull moves at least 20 feet straight toward a target and then hits it with a ram attack on the same turn, the target takes an extra 9 (2d10) bludgeoning damage. If the target is a creature, it must succeed on a DC 15 Strength saving throw or be knocked prone. The bighorner may then make a trample attack against the target. Sure-Footed. The bighorner bull has advantage on Strength and Dexterity saving throws made against effects that would knock it prone. Ram. Melee weapon attack: +7 to hit, reach 5 ft., one target. Hit: 16 (2d10 + 5) bludgeoning damage. Trample. Melee weapon attack: +7 to hit, reach 5 ft., one target. Hit: 14 (2d8 + 5) bludgeoning damage.